“Look Renée, it stopped raining!” Akhira pointed to the window and twenty-four pairs of eyes followed her finger. Sure enough, the incessant rain had stopped and we could, at last, have outdoor play. But for my kindergarten children the ceasing of the rain also meant that at our morning meeting we would all happily sing Blue Skies. 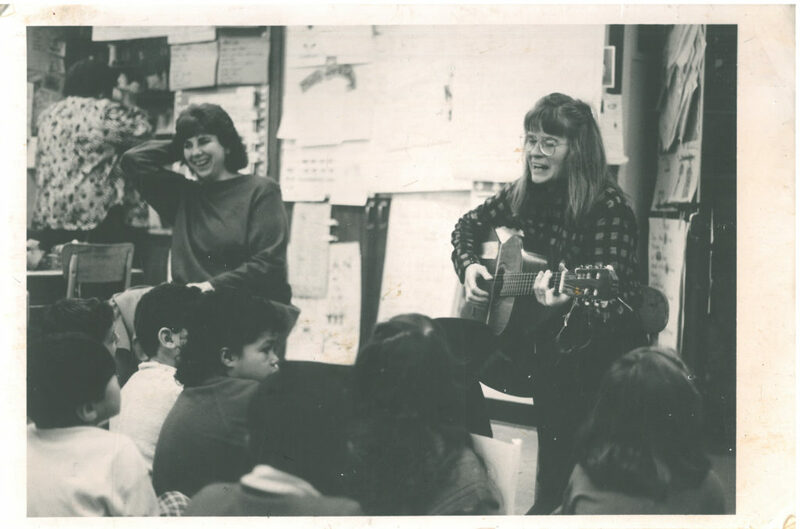 Singing together infused my classroom with good feelings. When Vicky had a problem separating from her father one morning, we all solemnly sang our Comfort Song – “What should I do if my best friend is crying? What should I do? I don’t know what to say. I take my friend in my arms and I hold her.” Of course the children then wanted to continue singing verses for their daddies, mommies, uncles, aunts, sisters, cats and puppies. Eventually Vicky too forgot her separation anxieties and joined in the singing. Community building in the classroom is probably our first goal as teachers. When we form a cohesive, caring community, class rules seem to easily fall into place. Children help and support each other, bullying becomes practically a non-issue and maintaining discipline is not the teacher’s priority. Before I continue writing about the importance and joy of singing with children, I must address the issue of voice. Many teachers have told me that they really cannot sing in school because they don’t have good singing voices. Truth be told, my voice is somewhat flat and I have difficulty carrying a tune. However, that never seemed to bother the children in any of my classes. Many literacy skills can grow out of the joyful experiences of singing together. Here are but a few of them. Because there are so many rhyming songs it’s almost difficult to know which ones to highlight. For starters there’s Down By the Bay, Jenny Jenkins, and This Old Man (which is also a counting song). Singing songs that mix up initial consonants such as in Willoughby, Wallaby Woo bring out lots of giggles but also involve children in thinking about the sounds of the consonants in addition to the rhymes. Besides the old standby of the ABC song, don’t forget about A You’re Adorable. My class loved to sit in a circle and write the letters on each other’s back as they sang. Then they rubbed their hands across the back that they wrote on to erase the letters, turned around and re-sang the song as they wrote in upper case! It was a non-threatening way for children to practice writing the alphabet and it gave me the opportunity to casually walk around the circle, singing and noticing who was still having difficulty with letter formation. A song that opens up opportunities for the engaging activity of going on hunts for spelling patterns is I Can’t Spell Hippopotamus. After we’ve had many opportunities to sing that funny song and come up with some simple spelling patterns (can, man, pan or bet, let, set) children set themselves up in partnerships, get sticky-notes and pencils, and peruse the classroom looking for spelling patterns on charts and in books around the room. Then we get back together and sing again, incorporating their notes into the song. It’s a game, it’s a song, it’s a spelling lesson, and it’s fun! After children know a song really well (“by heart”), put the lyrics on a chart and the children will begin making connections between the words that they have been singing and the words that are written on the paper. Children can then take turns being the teacher and, with a wooden stick (I’ve used a chopstick), point to the words as the class reads and sings along. Children might take turns looking for sight words on the song chart and underlining them. Then they might put circles or boxes around words in the song that keep repeating. The key importance here is to wait until the children have internalized the words of the song aurally before making them visual. When you do that, the print is meaningful to the reader. In June, I often celebrated our year of singing by recording the children singing together, making copies of the tape (would it be a CD today?) for each child and adding a sing-along songbook. I recently met a former student, now a college graduate, who told me that for years after kindergarten she listened to the tape and that the family played it when they went on long trips so that they could all sing along together, karaoke style! I like to keep in mind the words from an African spiritual that encourages us to “sing when the spirit says sing,” and to bring spirit and joy into each school day. Joyful singing can become a bridge to many joyful literacy learning experiences! Renee Dinnerstein is a featured speaker at our 2017 Literacy for All Conference, October 22-24th. She will be presenting on Monday and Tuesday of the Conference. This entry was posted in Investigating Choice Time: Inquiry, Exploration, and Play on August 25, 2017 by Renee.